Business As Usual by Gaynor Jones. “Gaynor Jones is one of the most exciting voices writing in flash fiction today. Her unique speculative vision, articulated with equal parts humor and pathos, transforms images of everyday life into a bizarrely wonderful modern mythology. She is a true original! Last weekend, 19th January, I had the pleasure of joining Gaynor Jones for the launch of her debut flash fiction collection, Business As Usual. Gaynor has been a regular contributor to Ellipsis, since she submitted Living With It during the call for submissions that opened this website, in 2017. Over the next twelve months, she’s appeared in the first four printed zines, which no other writer has managed, and I’ve nominated her creative non-fiction flash, To My Three Year Old Naked in the Bath for the Pushcart Prize. Needless to say, I’ve been a huge fan of Gaynor’s work. The work published in Ellipsis only scratches the surface of the wealth of great flash Gaynor is producing, which can be found in numerous other lit mags, such as, AdHoc Fiction, Bending Genres, Dear Damsels, Flash Frontier, Former Cactus, MoonPark Review, Paragraph Planet, Reflex, Spelk, The Molotov Cocktail and Train. Some of these great flashes have been collected in Business As Usual. The collection also includes several previously unpublished pieces of flash fiction. I was joined at the launch by Stephanie Hutton (@tiredpsych) and Joely Dutton (@JoelyDutton) on a packed train to Manchester and enjoyed the relaxed atmosphere of Gulliver’s Pub (@GulliversNQ). We devoured skull decorated cupcakes, while listening to live music from the brilliant Elmo Ashall-Kelly (@elmoakmusic). Elmo played a mini set of three songs ahead of a spoken word lucky dip, which included readings from Liz Ottoson (@liza_belle) and Stephanie. Gaynor rounded off the launch by reading four pieces from her collection. The award-winning, The Thing Between Your Legs, The Pelt Collector, 22 Bees and Business as Usual. Even my vain attempt to steal the limelight during Gaynor’s introduction, by spilling my drink, failed to upset the flow of an afternoon full of great readings. You can purchase copies of this limited edition collection via Gaynor’s website, and I urge you to. I can’t recommend it enough. It has everything a great collection of flash fiction should have – psychic lobsters, teenage drinking, teaspoons and vaginas, and zombies. Gaynor will be donating 10% of the profits from this collection to Movember U.K.
Gaynor Jones is a writer of micro, flash and short fiction. She was named Northern Soul’s Northern Writer of the Year 2018 and was the recipient of the 2018 Mairtín Crawford Short Story Award. She has been longlisted, shortlisted or placed in other competitions. 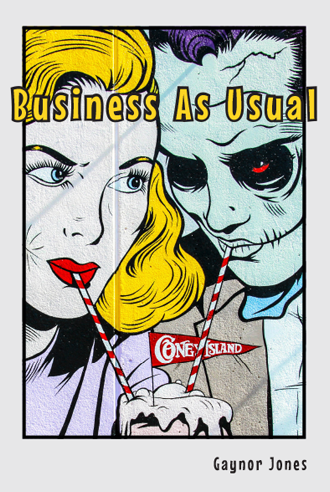 Business As Usual is her first flash fiction collection, and the title of her favourite flash piece. Gaynor lives in Manchester with her husband, daughter and a head full of weird ideas.